Who doesn’t love a good tablescape?! I’ve been wanting to try design in ways other than with flowers lately and what better way than to style a table. I wanted to create each one in a totally different vibe and now that I look at it, I feel like i was inspired by the seasons! Personally, I love things to be clean and simple but with intention. That’s my approach to designing flowers and I am super happy with how each scape turned out with the same idea applied. We don’t need a ton of details on the table to create something unique and beautiful. Which is so hard for us to remember sometimes when planning our weddings and scrolling through the gorgeous styled shoots and million dollar weddings on instagram and pinterest (though those are extremely pretty and inspiring!!). By being intentional with the details you do have on the table, you can create the most beautiful and elevated design!! So when you are planning your weddings tablescape, keep that in mind! Intentional details are the way to go! Rebecca + Richards vision for the day was a modern day 1920’s styled wedding. She had that gorgeous dark lip and classic tight curled hair. They got married in a gorgeous chapel in downtown vancouver followed by the reception at the beautiful benson hotel in portland. We created a gorgeous alter installation to bring in the moody vibe she was looking for and to add color to the overall bright and airy space. I loved the way they trailed up the stairs, especially in photos! For the Benson Hotel, we created jewel toned arrangements and tall branchy greenery arrangements to add some dimension to the space. Guests even came all decked out in swing dresses, beading, and fun hats to match the theme. I love how the family and all the guests were so into the vibe and came dressed for the occasion! Most definitely a wedding for the books, especially if you are a sucker for the roaring 20’s. I am super excited to see what the roaring 20’s look like in the next decade! My goodness, i dont eveN know where to begin with these two!! This wedding was absolutely amazing. Hidden in hillsboro is scholls valley lodge. When you pull into this venue you would never guess this gorgeous vineyard is literally 45 minutes from portland. They have wild flowers planted everywhere and a beautiful view of the hills. I think that may have been my favorite part about it, honestly. The vision sarah had for the day was to transform the barn into a beautiful overgrown lounge for everyone to eat the delicious food chefs table prepared and relax. We trailed southern smilax all along the twinkly lights and along the beams to make the space feel light and airy. Sarah also loves pampas grass, which is music to my ears! To create something unique and combine all her favorite things (the girl loves her eucaplyptus and pampas grass) we created a cresent shape on the ground full of eucalyptus and pampas grasses with pops of playa blanca roses to compliment the beautiful tree they got married under and create balance between the install and tree. For added oomph, i created mini versions of the install along the aisles to repurpose throughout the wedding during the reception (how cool did it make the bar look?!). We put dismantled the install and used it to style the signs and little nooks to make it feel like everything was overgrown. Nothing makes my heart happier than making sure the flowers are used in every which way during a wedding day. Its the perfect way to make your day all the more lush! Sarah and ken were the most lovely people to work with. They had vision and the kindest hearts and that makes me love what i do so much more. All the love to these two love birds. And of course, to the amazing team that made this day perfect! Ah, this wedding. All the jewel tones and forest inspired details. Hailey really wanted her wedding to feel like a little forest oasis with some colorful and moody elements. She told me she wanted a bold and funky bouquet (my favorite thing to hear!) so i went wild with lots of textures and dimension and of course - bounce! 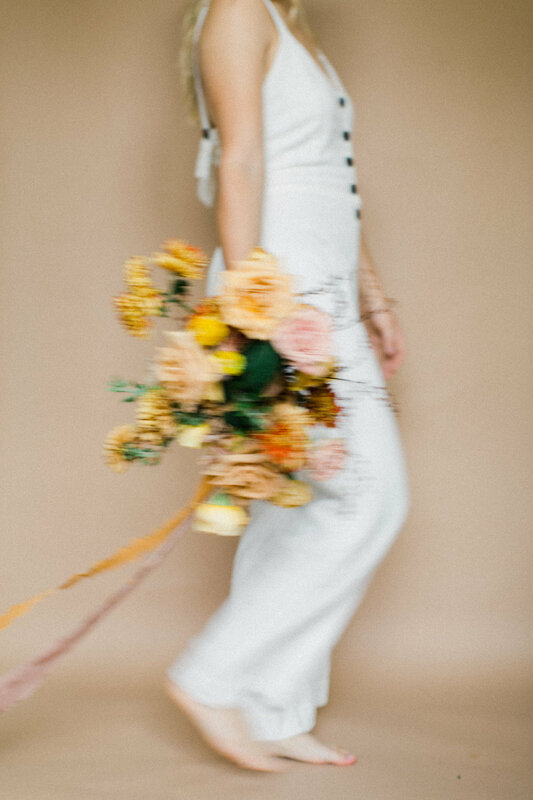 My favorite part about her bouquet was the way it bounced when she walked, it felt so fun and free. What i also loved about hailey was her openness to ideas. I really wanted to create a unique table arrangement for her and she was totally cool with me creating a fun little floral forest patch on her table! I mean… how cool does that moss look?! And then with those blooms growing out too.. one of the coolest table arrangements a bride has let me do. We made mini versions of this on her guests tables paired with candles and lanterns to create a really pretty minimal and inviting reception. Of course Vera captured this day so beautifully, and full of color. Doesn’t get any better! COORDINATION + DESIGN // OLIVE + RUST CO. 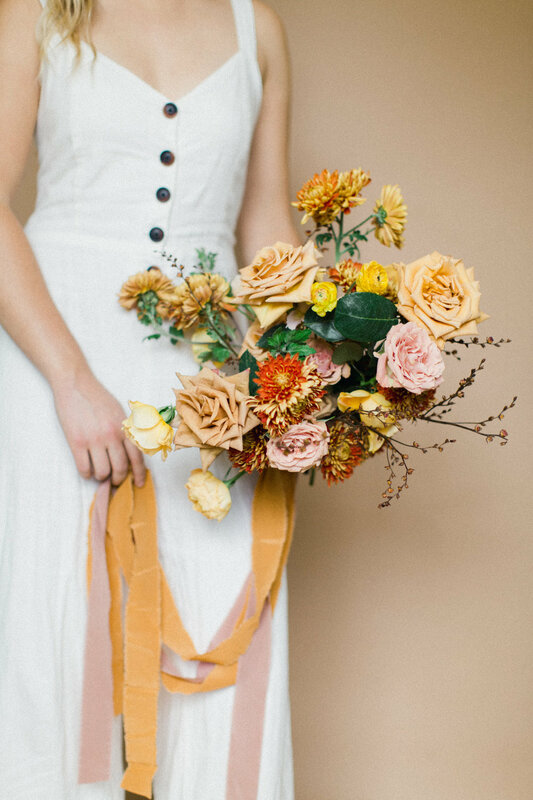 Wedding Design & Coordination // Olive + Rust Co.
Sign up to see the most recent photos of beautiful weddings and photoshoots! We respect your privacy, the only thing to grace your inbox will be beautiful florals!